New Zealand and Australia women will play a tie-breaker to decide the last team to qualify for the semi-finals following the tenth session of play at the Pacific-Asia Curling Championships 2014 being held in the Karuizawa Ice Park Curling Hall in Karuizawa, Japan. With China, Japan and Korea men and women already qualified for the semi-finals, the winners of the tie-breakers this evening, both between Australia and New Zealand men and women, will join them in the semi-finals. The final women’s round-robin session of the Championship saw the trans-Tasman neighbours go head to head, with New Zealand needing a victory to force a tie-breaker. After stealing one point in the first end, New Zealand then stole another three points in the second end after Australia skip Kim Forge was heavy with her final draw. Australia got on the scoreboard in the next end as they took one point before they stole another point in the fourth end after New Zealand fourth Thivya Jeyaranjan was heavy with her final draw. Jeyaranjan got her draw weight right in the next end however as she drew into the house to score two points and make the score 6-2 at the fifth end break. 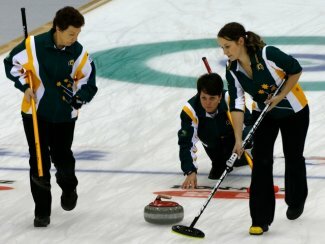 Although Australia took another two points in the next end, New Zealand saw out the game to win 8-5 after nine ends of play. This win secured a tie-breaker between the two teams, which will be played at 19:00 this evening. In the only other game of this session, Korea women finished off their double round-robin campaign having won all of their games. They defeated China this afternoon in a tight, low scoring game which went right down to the last stone. China blanked the first two ends before getting on the scoreboard in the third end when skip Sijia Liu made a hit for one point. Korea then blanked the next end before skip Eun Jung Kim made a draw into the house for one point in the fifth end. China then blanked the next two ends before giving up a steal of one point in the eighth end when skip Sijia Liu made a hit but could not clear all of the Korean stones out of scoring positions. This proved crucial. China blanked the ninth end looking to take advantage of last stone into the tenth end. They used this advantage to their benefit as skip Sijia Liu made a tap on one of her stones to raise it into a scoring position to give China the one point needed to take the game into an extra end. Korea made sure of the game however as skip Eun Jung Kim made a hit and stay to score the one point needed for their 3-2 win. Australia men and women will go head to head in tonight’s tie-breakers, which both begin at 19:00 local time (JST). The winner of the men’s tie-breaker will progress to the semi-finals where they will face Japan. The winner of the women’s tie-breaker will progress to the semi-finals where they will face Korea. The first games of the semi-final series begin on Friday morning at 09:00 local time (JST).